NALCHIK, July 4. /TASS/. 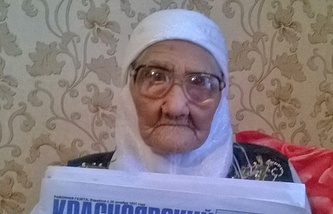 Nana Shaova, a supercentenarian from the North Caucasus region of Kabardino-Balkaria who has turned 127 years old, has gotten on the Guinness World Records, the press service of the regional administration said in a press release. "Nana Shaova, a resident of the Baksan district has been entered in the Guinness World Records as this country's oldest citizen," it said. "She has turned 127 years old. The editor-in-chief of the Guiness World Records' Russian subsidiary, Stanislav Konenko handed a special certificate to Mrs. Shaova that confirms her status of the country's oldest supercentenarian. He also said this was world record, too." The press service also said that before the proclamation of Nana Shaova as Russia's oldest resident, the title belonged unofficially to Tanzilya Bisembeyeva, who lives in the Astrakhan region in the low reach of the Volga River and who turned 121 years old this year. Nana Shaova's birth year, 1890, means that she arrived at the time when Queen Victoria was ruling the British Empire at the peak of its grandeur and glory, Wilbur and Orville Wright were yet to make their first flight ten years later, the discovery of X-rays by Wilhelm Roentgen would come about only in five years' time, while Auguste and Louis Jean Lumiere were still on the move towards the advent of motion pictures. Mrs. Shaova has lived through three revolutions in Russia (in 1905, in February 1917 and in November 1917), two World Wars, the Russian Civil War of 1918 through 1921, the fall of the Russian Empire, and the rise and disintegration of the Soviet Union. She has outlived the last Russian Czar, Nicholas II, the Bolshevik leader, Vladimir Lenin as well as the landmark leaders of the Soviet Union and Russia Joseph Stalin, Nikita Khrushchev, Leonid Brezhnev, and Boris Yeltsin.